It’s a common dilemma many parents face. How do you say no to your kids without feeling bad? When parents are too permissive, they may worry about what message they’re sending to their son or daughter. Are you encouraging tantrums by saying yes to candy at the checkout? Are you the only parent who allows their kids a flexible curfew? Does everyone else really have a cellphone/car/tattoo, and are you the worst if you say no? Parents often walk a fine line between too much leniency and holding the reigns a little too tight. So, how do you empower your kids to make the right choices when you say yes? And how do you live with the guilt (and the tantrums) when you decide to say no? First of all, like there are no perfect relationships, perfect jobs, or perfect people, it’s important to realize—there are also no perfect parents. If you’re holding yourself up to perfection, it’s not realistic for anyone. In fact, the very nature of childhood is to struggle for control and autonomy. Even if you attempt to parent by the book, your child will still struggle with empowerment simply because they’re small and the world is big. So, let yourself off the hook and out of the perfection trap. As a parent, there’s no winning the battle between over-controlling and under-controlling or over-permitting and under-permitting. Accept that it will happen and there’s truly no perfect balance. Studies show the average two-year-old hears the words “no,” “stop,” and “don’t” every nine minutes. Any parent dealing with the “no phase” will tell you they wish their child had never learned the word, but the fact of the matter is its part of the socialization process. Children are constantly learning, moving, and discovering. They’re testing boundaries and exploring what they can and can’t do. They’re torn between the desire to be close to mom and dad and stay safe, and the desire to discover themselves and the world around them. For their own safety, especially when they’re young, mom and dad must intervene with stop words. Saying “no” is going to happen whether you like it or not. However, the clearer you are on your boundaries and expectations, the less reactive you’ll need to be about saying no. When kids are held to clear cut expectations, boundaries, and even routine, they learn to trust you. They know what you expect of them and are less inclined to push limits and test the waters. Adler tells us the importance of a child’s will to their well-being. Children need agency and will in order to learn to build confidence and to feel empowered. The choice isn’t whether to eat vegetables (or dinner at all), whether it’s bedtime or not, or if they’re going to grandmas. This allows children to feel both empowered and learn to live within the boundaries set in front of them. It’s also key that kids learn logical consequences. Depending on the age of your kids, they can be both part of the discussion and part of the solution. Logical consequences aren’t limited to punishments either. They’re simply consequences of behavior. A friend of ours took her two kids to the Art Institute for the first time. Before they went, they discussed museum behavior and what was expected. She told them, “here are the ground rules and this is how we behave while we’re there.” The children were told three warnings meant it was time to go home. It’s not about leaving in a huff, getting angry, shaming, or berating kids when they go off track. They’re learning and mistakes will happen. Simply set expectations and always follow through. Kids will get upset. They may throw a screaming tantrum. But if they know it’s futile and you stick to your follow-through, they quickly start to know the boundaries. If certain behaviors matter to you, then it’s important you teach your child to act that way. One situation we see a lot among parents is inconsistency. One parent is the “fun parent” and the other parent is the rule enforcer. This sends a mixed message to the kids and leaves everyone confused (and likely frustrated all around). While it’s hard for anyone to stay consistent all the time, consistency is critical when it comes to kids. Intermittent discipline simply reaffirms to the child that his or her behavior is okay sometimes. It tells them they won’t always get reprimanded. Similarly, when one parent is permissive and the other…isn’t, parenting gets tough. This is especially challenging for couples who are co-parenting but are divorced or split up. Because we focus on the rules of engagement in all relationships (not simply romantic ones), parents learn blame is a two-way street. 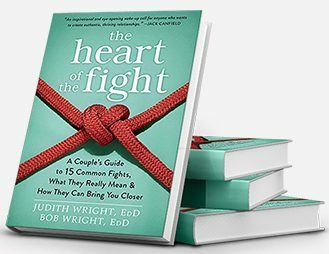 One of the rules of engagement, as we outline in our book, The Heart of the Fight, is no one gets more than 50% of the blame in any given situation. This means you can’t blame your kids’ behavior on the other parent. So how do you reach a consensus on parenting decisions? We encourage parents to always go with the higher denominator (and really look at it honestly). Who has a higher standard and the higher value system at work? Even if it’s not yours, concede and go with it. It’s normal to want your kids to like you. You may want to please them because it feels like you’re winning their affection. This is particularly common after a divorce or breakup. But remember, it’s more important to teach your kids appropriate and consistent boundaries. While it’s uncomfortable at first, in the long run, it will help your relationship all around. As a parent, there are times when you’ll long to reel in your kids’ behavior or you may want to steer them in a certain direction to protect them from making mistakes. It’s vital to realize kids are often more resilient than we may think, and mistakes are part of growing up. If your child brings home a test score that’s not their best or gets in trouble for acting out, it’s tempting to protect them or intervene on their behalf. We should also ask ourselves, what lesson are we sending to our kids when we fight their battles for them or don’t allow them to advocate for themselves in a situation? We may think we’re protecting them from a bad report card or preserving their reputation, but what lesson do they draw from the situation? Instead, it’s okay for your child to face consequences for their behaviors at school. If they didn’t do their homework for two weeks, you can’t bargain with the teacher on their behalf. At the same time, if your child is struggling with a topic, ask how to help them feel empowered and successful. How can you help them navigate the situation so when they succeed, their success feels earned? Discuss the lessons from situations with your kids but let them draw their own conclusions. Why should they follow rules or behave a certain way? Why is it important for them to do their homework? Parenting is hard; it’s an on-going process of learning for you and your kids. Set appropriate boundaries, stay consistent, listen to your kids, and offer clear-cut expectations. Empower your children to become the successful adults you know they were born to be. For more ways to strengthen your relationship with your family, please visit the Wright Foundation. Join us for an upcoming parenting seminar or our More Life Training, where you’ll connect with others on their journey.